My mother-in-law is fighting for her health. Very sorry to hear this Denalee. Thoughts of healing and love to you all. So sorry to hear this news...I will keep her in my prayers!!! I am hoping to find a bit of time to create and visit you for your wonderful inspiration and friendship!! I will include your mother-in-law in my prayers. Have faith, God listens. she will be in my prayers! You will all be in my thoughts and prayers Denalee. sorry to hear the news. love the butterfly analogy. so perfect. will say a prayer for her. What a beautiful post!?! No doubt I am praying for your MIL. So sorry to hear -- my best wishes to her. Sending prayers up for your mother in law! Love the thoughts you have written here. I am sorry to hear this sadness for you and pray for her also. Thank you Denalee! Your blog is sweet and tender. Denalee, tell us about taking that photo. It's your own isn't it? Actually, our oldest son, Trevor, took that photo at the big family reunion in Antelope, Idaho. 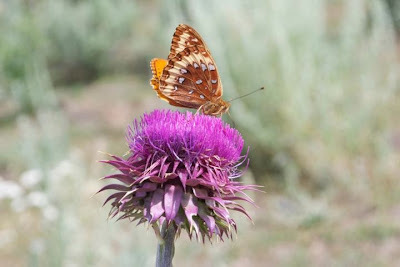 He was taking Sierra's senior pictures out in the sage brush and wheat fields and came upon this butterfly liting on a thorn. Gorgeous, isn't it! Mom is doing so very well in recovering from the brain surgery. Her positive outlook is outstanding! My deepest hope is that she continues that spirit through the radiation and chemotherapy and that she is surrounded by love and peace. Thank you for thinking of her.